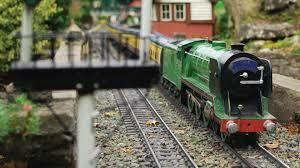 Train and modelling enthusiasts are fortunate that Ronald Callingham wanted to share his interest in model railways with the public by opening his garden to visitors, asking only a donation for entry, otherwise the town would not have this World Famous Attraction. It was in 1929/30 that Bassett Lowke was commissioned to build the railway where the tennis court once existed and, at which time, the swimming pool was being turned into the ornamental lake. Bassett Lowke provided the track, engines and rolling stock at a cost of £179. The earlier maps and brochures show an ‘Out and Back’ layout. This consisted of a terminus, Maryloo, with six platforms having an overall canopy, leading to a double track to North Bekonscot, which had an island platform, then on to Greenhailey, a model of Beaconsfield Station and Bekonscot, both of which had four lines to allow express trains to overtake local trains. The next station was Hanton where the track became single until Splashyng, then passed over Alexandra Bridge, based on the design of Sydney Harbour Bridge, to cross the lake, followed by a return loop through Evenlode station. Later Gulley Junction was made between Bekonscot and Hanton into Maryloo to allow trains to take a more direct circular route, both clockwise and anti-clockwise. Initially the railway had a three rail system, the third rail for electric pick-up at 20 volts dc. When insulated wheels became available all track was converted to two rail, at a voltage of 28 volts dc, giving a more authentic appearance. Originally there were positions for operators around the site, but now all control is by means of computers, using direct digital control located in a genuine former signal box. The scale of the railway is 1 to 32 and the gauge is 45mm. The buildings and people are to a scale of 1 to 12, but few visitors seem to notice this discrepancy. At one time all new buildings and changes required planning permission from the council, even when they were being removed for repair or repainting. The process involved submitting plans and much paperwork, but this requirement eventually ended as recently as 2004. 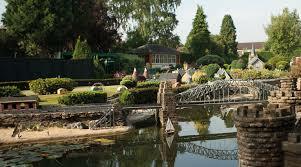 What is not generally known is just how close Bekonscot came to being shut down or relocated in the 1960s. Concern had been raised by local residents about the noise that the crowds created and particularly the amount of traffic and parking problems. Sunday opening was under threat. 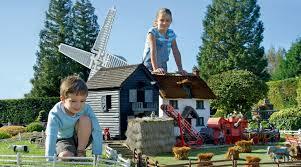 A petition signed by 2250 people in support of Bekonscot was submitted. The situation reached County Council as well as Beaconsfield UDC level who tried to find an alternative site with locations at Hedgerley Lane and Broad lane being suggested. The Trust at Bekonscot were not prepared to accept that and threatened to close, but a field at the back of St Theresas Church was offered as a car park and the matter was resolved. For full details of opening times and further information go to the Bekonscot logo at the foot of the home page. Don’t miss the train driver’s view from the cab.